“AllBright Designs” is a Canadian Startup company with focus on socially meaningful projects in the field of Virtual Reality. The team has more than 10 years experience in VR technologies and services. Their software products have main applications in Construction, Architecture and Education. Company's motto is "High-tech for a better, more sustainable world". The client envisioned that their website will be very clean, modern, slick, and minimalistic. They wanted white or light grey background, having images seamlessly dissolving into it. For accents, bright splashes of graphic elements in logo colors could be used. Another requirement was that the design should make room for nice and smooth animations like parallax. The challenge here was to include colors and geometrical elements from the company branding but still maintaining serious and corporate feeling. I started by delivering a Stylescape in order to give a general idea of the creative direction. The color palette included pastel nuances of blue except the bright one that was used for call-to-action buttons, and together with the green that was only used for the geometrical elements. After approving stylescape, we continued with discussing the main layout and constructing Wireframes. 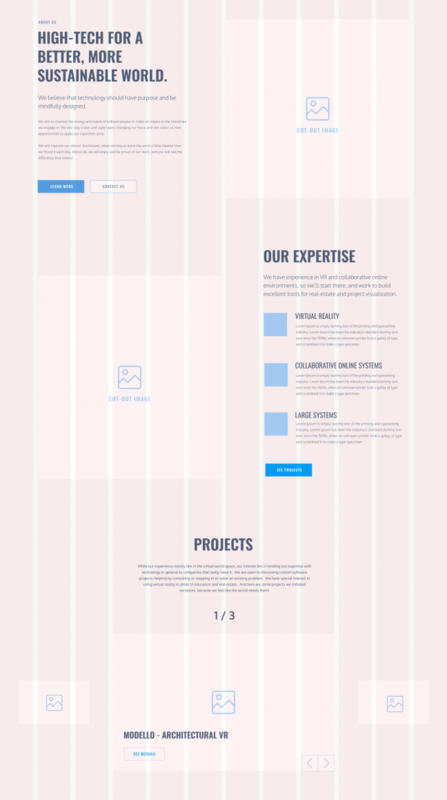 I had to come with a way to present project section so that its design will be suitable even for a single project, because the release of the website was starting with only one finished product. My work involved also tweaking icons in order to achieve better consistency. 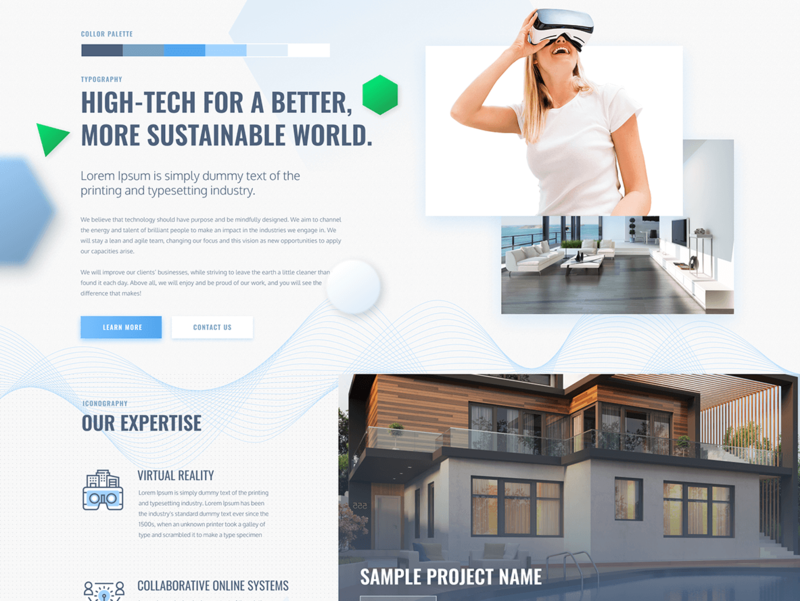 Having blending photos and parallax geometrical elements with different focus, gave depth to the website and this fit really well the the VR field of work that the company is in. The client didn't have much content, that's why the icons chosen for the "expertise" section are a bit more complex in order to keep the visual interest. The main menu button is floating on the top left while user scrolls. Project section was decided to be a carousel that has centered active element, because in this way it can guide users attention and can look good even with only one project.